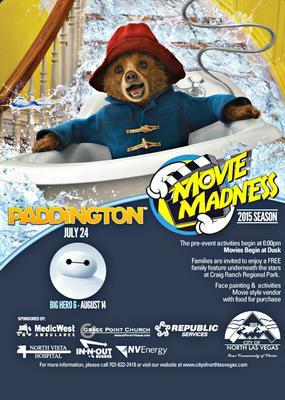 Join us on Friday, July 24th at the amazing Craig Ranch Regional Park (628 W. Craig Road) for a movie under the stars. Admission is FREE and families are invited to enjoy a feature presentation under the stars with food for purchase, face painting and inexpensive pre-event activities. Coolers, picnic baskets and blankets are welcome. No pets (service animals permitted), alcohol, high back chairs, tables and umbrellas.